Is It Good? 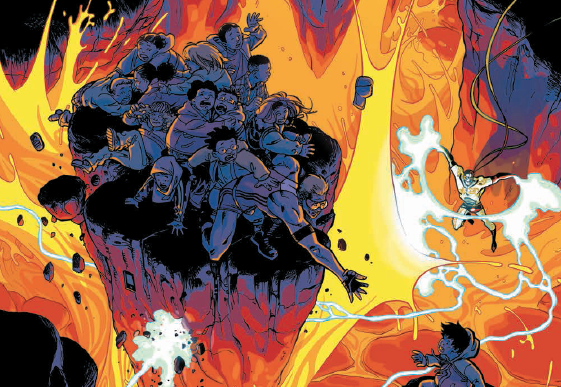 Secret Identities #4 Review – AiPT! One of the best superhero comics on the stands gets a new issue this week. Why is it the best? The characters all have mysterious backstories and complicated lives — like one is the president’s daughter and another has two wives. Plus.. one of them wants to get rid of all the others. Secret Identities #4: is it good? Last issue focused mostly on one long fight sequence as the heroes got their asses handed to them. This helped show they aren’t as powerful as we may think and that vulnerability is going to really get them killed later in the series. They made it out though and this issue opens on Kayoto trying to figure out what to do about saving her kidnapped brother, Vesuvius and Punchline hanging out with some kids for a media day sort of deal and Whirlwind getting a little bit closer to ruining all of their lives. This issue doesn’t reveal why Whirlwind hates the team so much, but that’s okay, because it delves into characterization for everyone across the board. The problem with series such as this one with so many characters is it’s hard to juggle them all and deliver a meaningful story for all of them equally. To get around this not every character make an appearance and really this is Vesuvius’ issue. The story focuses on an old friend of his who is the granddaughter of the man who found him in Pompeii. He’s always had a kinship with this family so when she says someone is trying to hurt her and it’s not her fault he takes her word for it. Of course like these heroes she’s holding a secret, which sets off a fight sequence involving a character named Rey De La Luz. He’s basically a Mexican hero and the fight sequence is fun and entertaining. Writers Jay Faerber and Brian Joines use this to show Vesuvius is just as vulnerable as the rest and it appears family might be the biggest issue for all these characters. They also check in on the speedster of the group, the guy with two wives and families, and it’s a nice respite from the action as we see a happy moment for him. When you’re as fast as he is and juggling so much we see what 10 minutes of uninterrupted time can truly mean. Where did he really come from? The writers suggest an impending danger is coming as well, one that will most likely take all of the characters working together to solve, which is going to be a great sequence for sure. The kidnapping storyline doesn’t move forward too much, but the theme of family being our greatest weakness is made loud and clear. It also sets up a potentially dangerous moment for Kayoto and a potential first strike from Whiplash so keep your TVs tuned here. The art by Ilias Kyriazis continues to be fantastic and has an Erik Larsen quality to it. He’s juggling a lot of elements per page, and always seems to slip in a fantastic original layout too, and he’s clearly capable of delivering important information in the smallest of panels. Of course one might find it annoying a nice character moment between Punchline and Vesuvius is reduced to a one inch area of the page, but it still works nicely due to Kyriazis’ detailed art. Another great chapter that may slowly progress the plot, but delivers good character development across the board.